Decided to build me a rack for staging our cars. This is the first year to help as a leader to run our packs derby. I decided there had to be a better way to stage our cars, than to tie up several tables. This is what I came up with. 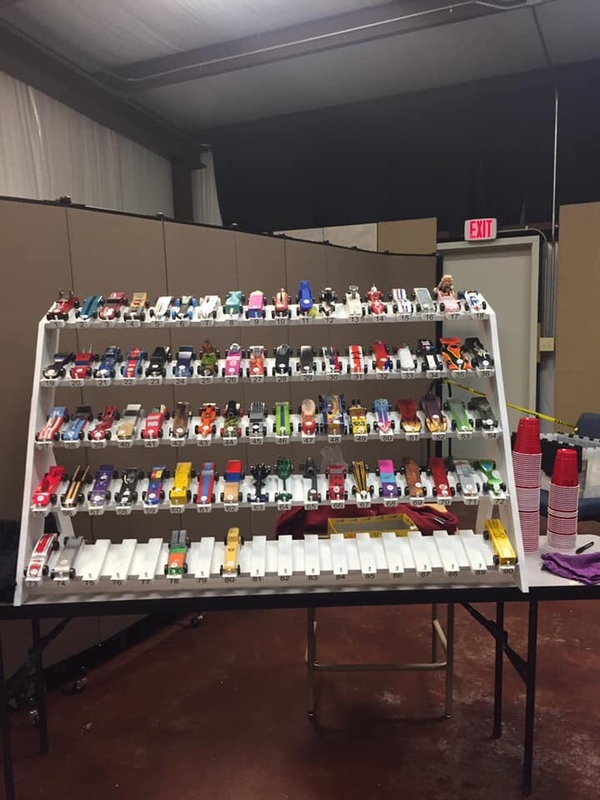 Each car is displayed well, and all wheels are suspended with no contact with the rack. It worked very well for us. Re: Decided to build me a rack for staging our cars. Thank you. I've been trying for a while now to access the url through my iPhone with no luck. My computer skills are lacking. It's been years since I've done the forum thing online. Zebracar, are you at all concerned someone is going to bump into that? I am sorry to be a "Negative Nellie" but after being with the scouts and the Derby for the past 34 years, I have seen some horrible, totally unnecessary, things happen. I'd be curious how it works out in practice. 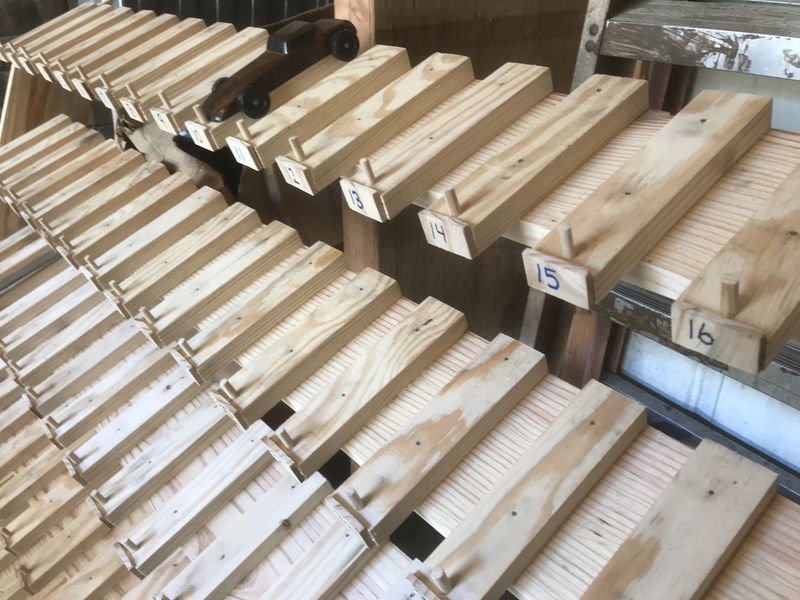 Our impound racks are basically boards propped up on an incline, with the cars arranged in rows and wheel stops attached to the boards to keep the cars from rolling forward. If I were building new impound racks, then I'd use 3/4-inch thick center rails like this (to keep the cars off their wheels entirely), but I don't think I'd stack them like you did. I'd keep them on a slight incline, so the rows behind are slightly above the rows in front, both for visibility and access for staging. It doesn't show in the pic, I have a thin block of wood sticking up 1/4 inch. The tip of the front of the car rests on the block to keep them from slipping. 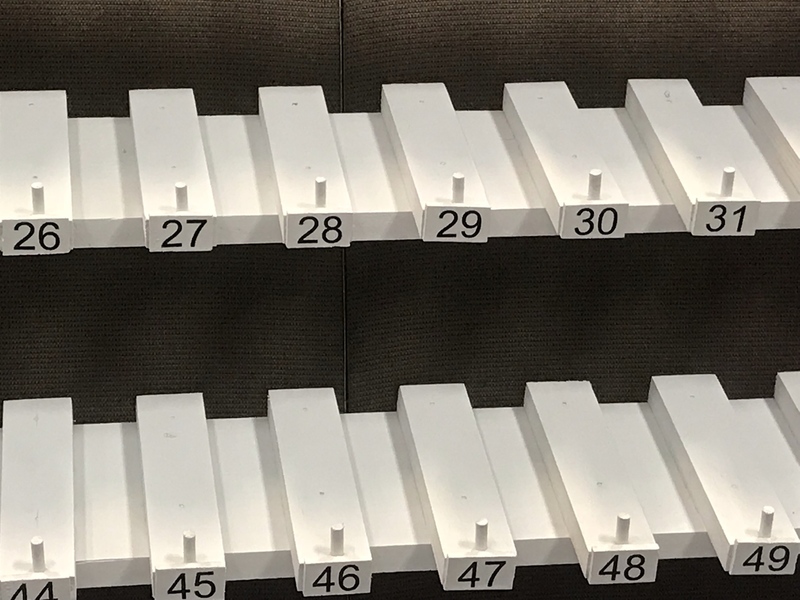 Those block also made a great place to place a number. After using it one race, I noticed that a couple cars had a rounded up front nose, allowing the car to try and slide off. Those cars where placed backwards for that reason. Before I use it again, I will ad a 1/4" dowel at the front of each slot. It will stick up 1/2 to ensure no car could possible slide off. Also the rack stayed on stage where only myself and the cub master had access. Zebracar, I know you mean well and I do wish you well. After using it one race, I noticed that a couple cars had a rounded up front nose, allowing the car to try and slide off. Our home-made track's start gate had a similar issue. 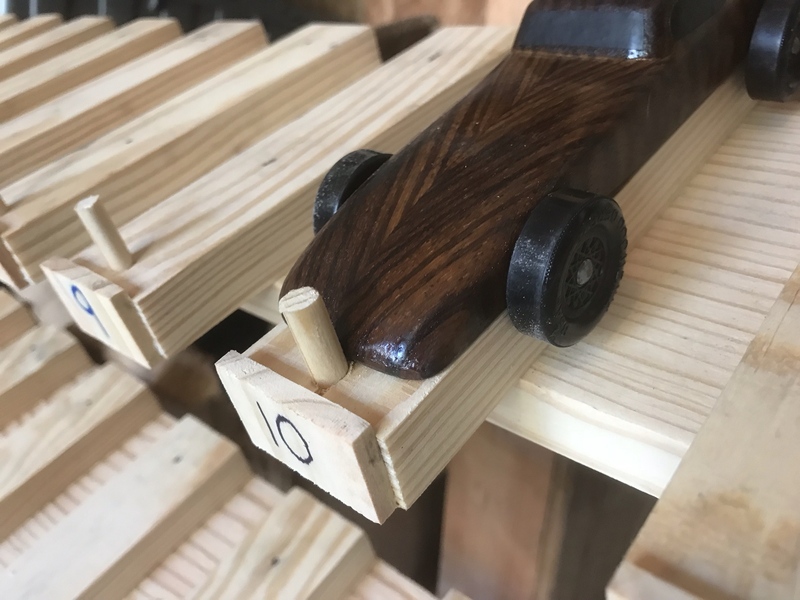 The start "pins" (really 1-inch wide aluminum bars) came up only half an inch above the track, and we were getting "boat shaped" cars that would slip over those start "pins". So I figured out how high the top of an unshaped block would be with the wheels mounted, and replaced the start "pins" with longer bars that would reach that high. Then we added that dimension to our "fit the track" rule. This was my fix to make sure none of my cars slipped off the rack. A few cars had the bottom of the front nose rounded up. As a result a few cars tried to slip off and had to be put on the rack backwards. The 1/4" dowel rod, sticking up 3/4" tall, should keep any cars from slipping off. 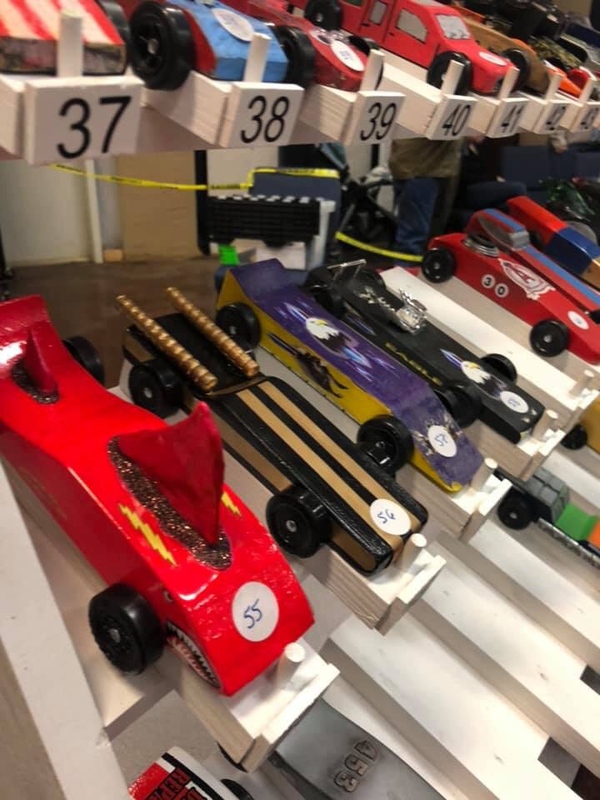 We will see how it works this weekend, another cubscout pack will be using it for their derby. Then the same cub master will use it again for our district race. And now she's got two races under her belt. This time she had a fresh coat of paint and an upgraded stop pin at the front of each car position. Very nice, I think I may steal this for next year (the idea and design, not the rack lol). We segment our cars by rank so maybe we could make something shorter and/or more narrow. Also, just spitballin' but I might try and make the parts where there's numbering on the wood blocks into a dry-erase surface.